At the beginning of next week, we were assigned a packing date of July 18th and made reservations to leave July 26th on a British Airways flight to London. Oran would stay one night, then fly on to Dallas, and I would stay 4 more nights as a concession for our not stopping in Athens again, which I had wanted to do. I started getting organized in earnest for the packers. That was going to be a headache, but something that had to be done. It was a good thing I already had a little bit of a head start. Some going away parties were being planned for us. In fact, the first one was Monday of that week, June 19th, 1978, at Bob Howie's bachelor pad. Besides being one of my bowling partners and involved in a lot of our social activities, I think he was grateful for the "cowboy" Stetson hat I bought for him in Texas and hand carried back to Arabia on the plane after one of our vacations. The Sorority would have an Arab dinner for us, which I had requested, and our close, close friends were planning another party, which would probably be a real "toot", or maybe sad. I even planned to give one for us myself. Going Away Party at Rob Howie’s: Oran, Bob, and Colleen; Bob and his Scottish friends. 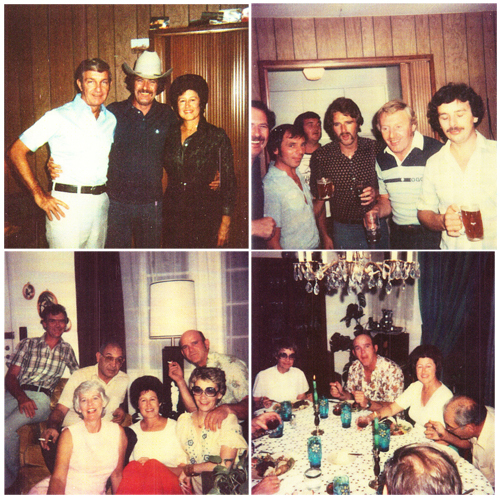 TGIW Party: Keith Kaul, Chris Desantis, Jerry King, in front: Marge Desantis, Colleen, Jeanine King; Gathering at the King’s house. 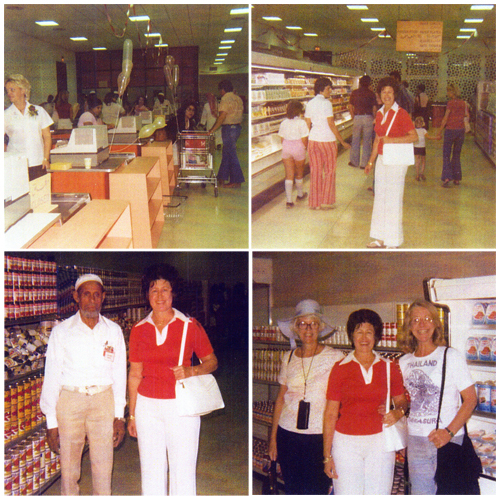 In keeping with my resolve to go shopping in Al-Khobar once a week, I caught the 4:30 shoppers bus directly there from Abqaiq the next day Tuesday, June 20th, 1978. I had decided to order a name necklace in Arabic, so went into several jewelry stores to check on designs and prices. I ended up in the very popular Middle East Jewelry Store in the second block of King Khalid Street. The familiar old Arab owner was showing me samples to order but said it would take several weeks. He did have one in the store that had been ordered for another woman who never picked it up for some reason. When he told me the name was "Colleen" I couldn't believe it, but I had not told him my name yet, so didn't have any reason to believe he wasn't telling me the truth. I questioned him again and again to make sure it was indeed my name, then decided to buy it, just in case an ordered one wouldn't get there before we left. Of course, I told him I would have it checked and would have to return it if it was not my name. He agreed, and I knew from past experience and from others that this was a legitimate and fair jewelry business. Can you believe that? It was almost "deja vu". The next day back in Abqaiq, I had it checked by an Arab friend who at first, to my dismay, couldn't read it at all, but then discovered I had it on backward, as the clasps were on the wrong ends. When I turned it around it indeed did say, "Colleen". I was so relieved and even thought it was neat to have the clasps reversed as the Arabs read everything from right to left instead of the other way like we do. Since then, I have had a lot of Arabs call me by my name because they can read it on the necklace. I love it. As the next day started a holiday weekend, I decided to give ourselves a TGIW (Thank God It's Wednesday) Party on the spur of the moment. So I called Jeanine and Jerry King, Marge and Chris DeSantis, Ruth and Tom Dominy, Gerri and Ron Hook, and Keith Kaul, all of whom would make it. Then I went to the Commissary to get some snack foods, and drink supplies, and we ended up with a relaxed, fun gathering. It didn't turn out to be a good weekend, however, as a really bad shamal (sandstorm) started blowing the next day, Thursday, and didn't let up for 5 days. Before then, everybody was about ready to go bananas. Oran and I did a lot of work then trying to get organized for the packers. On Friday, we did get out to go by the DeSantis' for a drink, then to the King’s. Keith Kaul was there as well. I had a really good time. But at the same time, I knew enjoying good times with these particular people would soon come to an end, so I wanted to relish it as much as I could. The following weekend on Thursday, June 29th, 1978, our Sorority had planned another beach party at Qurrayah. It was going to be an evening cookout, so we all caught the 4 o'clock bus to go out there. Our group staked out several of the covered picnic table areas. We unpacked the food and the guys got the grills ready. A few people swam or walked on the beach, but mostly we just visited and horsed around while drinking Pepsi or Teem. The sun started to set, and it was one of the most beautiful we had ever seen, a large, bright, orange-red ball slowly sinking into the desert sand horizon. Everyone laughed, but it was like saying farewell to the beautiful sunsets of Arabia and the beach to me. In spite of that, I enjoyed the evening. The next day, Friday, June 30th, 1978, was a very unusual day in Abqaiq, and in fact, for all of Aramco. The one and only shopping mall in any of the Aramco camps was completed, and there was an Open House that day from 3:00 p.m. to 6:00 p.m. to provide an opportunity for everyone to see the facility before it opened for business the next day. It contained the new Commissary, a branch of the Aramco Cash Office, the Mail Center, Housing Office, Travel Office, the Beauty and Barber Shops, the Community Information Office, Laundry Outlets and Laundromat all under one roof. It was really an unbelievable building for over there, big, bright and beautiful. 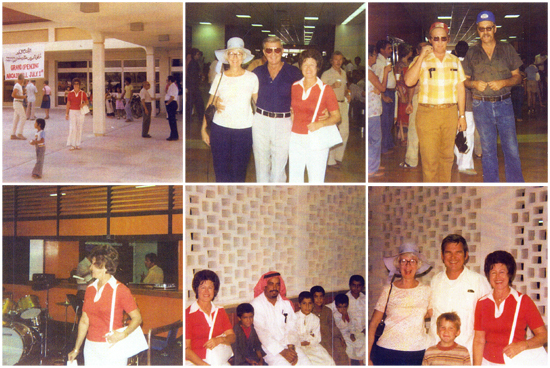 Pre-opening of the New Mall: Colleen; Marge, Oran and Colleen in the mall; Unknown crowd; Colleen in front of Post Office; Colleen with Arab man and children in front of the Commissary; Marge Desantis, Art Spitzer, his son, and Colleen in front of the Commissary wall. The Commissary seemed so huge after what we were used to and as nice as any supermarket in the States. Everyone wandered around in a happy daze, "oohing" and "aahing" over everything. The Abqaiq Dixieland Band was playing just in front of the mail center and across the hall from the Commissary. A bench had been built the length of the Commissary wall. The school band had been set up outside at the Mall entrance to play for the occasion. It was all very impressive. The official Grand Opening, with a ribbon-cutting ceremony, was held on Saturday, July 1st, 1978, the next day at 9:00 a.m. at the 25th Street entrance. The Commissary Department Manager, Ali Baluchi looked on as Aramco Vice President. Larry Tanner cut the ribbon. Abqaiq would certainly never be the same again. It’s too bad I wouldn't get to enjoy it much, or so I thought at that time. New Commissary: Check-out stands; Colleen by the frozen foods; Colleen and Commissary Worker by the canned foods; Marge DeSantis, Colleen, and Shirley Hurt (a single teacher) in the pork room. Oran had talked to Mohammed Zarah on the phone again, and he had invited us to Riyadh to visit on Tuesday, July 4th, 1978. We made arrangements and caught a Saudia Flight from the Dhahran Airport that morning and were on our way there again for the second time that year. Mohammed met our plane and had a car and driver waiting to drive us to his home, a very impressive, three-story, second-floor residence. It was beautifully furnished with modern European furniture and more richly elegant than any Arab home we had been in so far. Mohammed's wife, Nora, and some of their children came into the room to greet us. We recognized Nora, but the children had changed quite a bit in 10 years. Their oldest son and his boys were in school. The women wore long dresses but didn't cover their faces or hair. Some older female cousins came to visit while we were having tea and coffee. Their faces were not covered either, even in front of Oran. The way of life seemed to be a lot more progressive in Riyadh, at least in the home. 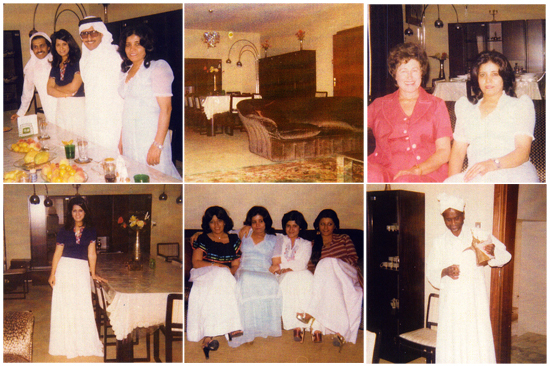 Trip to Riyadh: Mohammed Zarah with his son-in-law, daughter, and wife Nora by the dining room table; Dining area; Colleen with Nora in the living room; their daughter; 3 female cousins with Nora; their servant serving coffee. We were served an elegant dinner, sitting around their dining room table. It was served by a thobed and turbaned servant, who made an elaborate ritual of pouring coffee from the Arab pot into the tiny bell-shaped cups he held in his other hand. We felt like we were being entertained royally. They might really have been a part of the Royalty. After more visiting and promises to keep in touch, even after we left Arabia, we were driven back to the airport. As it turned out, our plane was going to be late, so we had some time to kill in the Riyadh Airport. As the general waiting area was crowded and not that desirable, we wandered down to a far wing and discovered a very elaborate and comfortable, and best of all deserted waiting area, which we immediately occupied. After about 30 minutes, a uniformed Arab came into the room and informed us that this was the private waiting area for the Arabian Princes, and one of them would be arriving soon to depart. He was very polite and asked us if we would mind leaving for a while and returning after the Prince had left. So of course we did, but waited in an area nearby, and sure enough, in just a little while there came a very tall, light, blond headed Arab (I kid you not), with an elaborately decorated beige and gold robe flowing around him as he strode down the hall and into the waiting room we had just vacated, followed by an entourage of Arab men. It was some sight to behold, I can tell you. After another short period of time, the uniformed attendant came out of the room and informed us we could return there to wait for our plane's departure. He even offered us some Saudi wine, which is fruit juice of some kind, good-naturedly, so we accepted that and waited there until the call came for our plane to leave. I had never felt so privileged before. On the flight back to Dhahran we had seats in the front section of the plane, possibly the women's section as we were directly across from and facing two black cloaked and veiled Saudi women. As juice was being served during the flight, I wondered how the women would manage to drink that with their veils on, but soon found out. They merely held the veil out away from their faces with one hand while bringing the juice up under their veils with the other hand, never revealing any part of their anatomy, very clever. All in all, that trip had been an unusual, enlightening, and educational one. I'm so glad we were given that opportunity.